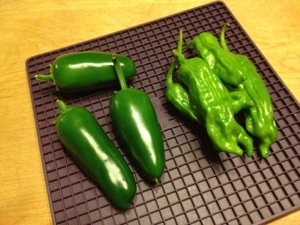 I recently harvested some hot-ish peppers from my garden. Jalapeño peppers we use often. I bought a rather established plant from the local nursery out here so no surprise the plant has begun producing. But the Greek pepperoncini I got as a tiny little starter and about three or four weeks into it a cutworm sabotaged it. I propped it up with a stake and hoped for the best, but secretly I thought it was a goner. So I’m thrilled to see it producing now! But…what to do with them? I haven’t quite figured that out yet. Vinegar will likely be involved. This entry was posted in Food, Opus, The Daily and tagged garden, gardening.